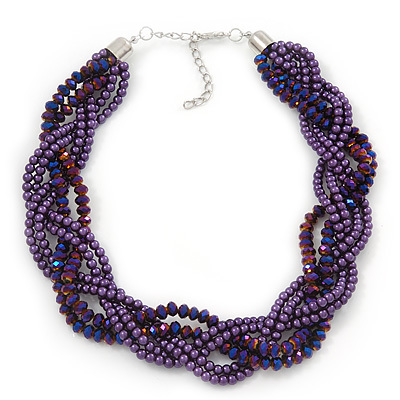 Get a bold beaded necklace for an eye-catching evening accessory. Featuring a 4-row braided design choker, made of 2 strings black beads and 2 strings of dazzling violet, faceted crystal beads. The necklace measures approximately 36cm in length and has an additional 5cm silver plated extender that fastens with a silver plated lobster claw clasp. You'll love the attention it'll get.